Imagine living in a house or apartment with no toilet, no stove, no HVAC. Imagine crowding your whole family into one tiny bedroom. Imagine leaky roofs, moldy air, faulty electrical wiring and roach infestations. Imagine living out of your car or sleeping under a bridge. If you can’t imagine, or if you think these are third-world or inner-city problems, think again. Census numbers indicate that approximately 27 percent of Beaufort County residents live in substandard housing, and some have no place to call home. Habitat for Humanity is a non-profit organization seeking to eliminate substandard housing and homelessness by building affordable houses for deserving families. Founded in 1976, it has built more than 300,000 homes worldwide, providing more than 1,000,000 people with safe, decent, affordable shelter. The Hilton Head Regional affiliate, founded in 1990, has built more than 80 houses in the Hilton Head Island and Bluffton, South Carolina area, providing affordable housing to over 300 people in need. But Habitat is not in the business of handouts. “It’s a hand up,” said Wirth, explaining that applicants are carefully screened and are required to meet strict requirements, including willingness to put in “sweat equity” hours. Homeowners must complete 300+ hours of service before being sold a home, including 100 hours before the home is begun. Sweat equity hours are earned through construction, site preparation, community service, education, or supporting other Habitat activities. A Hilton Head Regional Habitat for Humanity house is built at zero profit and Habitat goes on to hold the mortgages on the houses at zero percent interest. The ultimate goal is to end the cycle of poverty, Wirth continued, explaining that for families, especially those with a lower income, ownership is an important means of wealth accumulation. When a family’s monthly housing expenses are used to pay off a mortgage, that family accumulates wealth in the form of equity in their home which can be passed on to future generations. At the same time, homeowners become more responsible and productive employees, more loyal citizens and more effective parents. In turn, their children enjoy improved health, higher academic performance and a greater sense of self-esteem, which gives them a better opportunity to succeed in life. 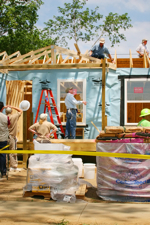 Habitat is looking for volunteers to build houses, but that’s not all. If you would like to volunteer but are not interested in joining the construction crew, there are many other opportunities for you to help, including ReStore sales, fundraising events, or as a board or committee member. If your busy schedule doesn’t permit you to volunteer, you can always make a donation or become a sponsor; all contributions are tax-deductible. Finding land is one of Habitat’s biggest challenges. If you know of any available property, contact Patricia Carey Wirth at patwirth@habitathhi.org. For more information, visit www.habitathhi.org or call (843) 757-5864. On September 21, 2009, the Oldfield Club and SunTrust Bank will sponsor the 12th Annual Hilton Head Regional Habitat for Humanity Golf Tournament. Don’t miss this opportunity to help build a better future. Auction includes a trip for two to Pebble Beach, three rounds of golf, airfare and lodging (sponsored by Chatham Parkway Lexus, Lexus Champions for Charity). For information, contact Laurette Doscher (843) 342-8002 or e-mail laurette.doscher@suntrust.com.